Photo courtesy of Parkshore: Parkshore provided $5,500 to cover holiday tree lighting in Madison Park this year. Trees in Madison Park’s business corridor are alit once again for the holidays, thanks to funding from the Parkshore retirement community. The Madison Park Business Association typically funds the holiday tree lighting with donations from residents and businesses, but struggled this year to meet the high cost of putting up the display. Madison Park Community Council president Karen Kane decided to reach out to Parkshore executive director Annika DiNovi to see if the senior living community would pitch in. “I have gotten to know our dear neighbor and Madison Park Community Council president Karen (Kane). She had given me a call probably a month ago and said that the business association had reached out to her and was trying to raise some funds and was hoping she might have a lead or someone to reach out to,” DiNovi said. Parkshore is still under construction, with Transforming Age investing $30 million in upgrades to the Madison Park highrise. 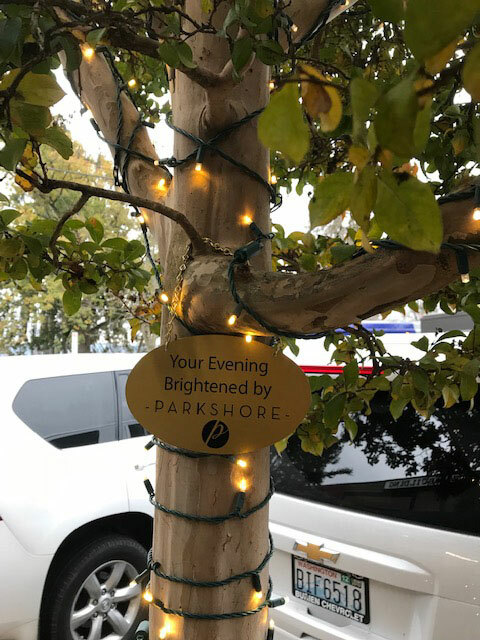 Since exterior work meant less space for the community to put up its traditional holiday lighting, Parkshore tapped its lighting contractor to complete the tree lighting for the business association to the tune of $5,500 for 23 trees. A number of signs were also created by Parkshore, which identify it as this year’s sponsor on several of the lighted trees. The Original Childrens Shop owner Kellie Etherington was coordinating the holiday tree lighting project for the business association, which did collect a number of donations from community members and businesses this year. Etherington said those funds will now be used to provide additional lighting in the neighborhood.